Wang is a Chinese-American “singer-songwriter, record producer, actor and film director” now working out of Taiwan. “He is also a four-time winner of Taiwan’s Golden Melody Awards, the ‘Grammys’ of Taiwanese music.” Kwok is an actress from Hong Kong. Gackt and Yamamoto are from Japan: Gackt, from Okinawa, and Yamamoto, from Hyogo. Hyde (Takarai Hideto 寶井 秀人) is from Wakayama, Japan. Moon Child Movie Trailer, uploaded to YouTube by VniaV on 18 Aug. 2006. 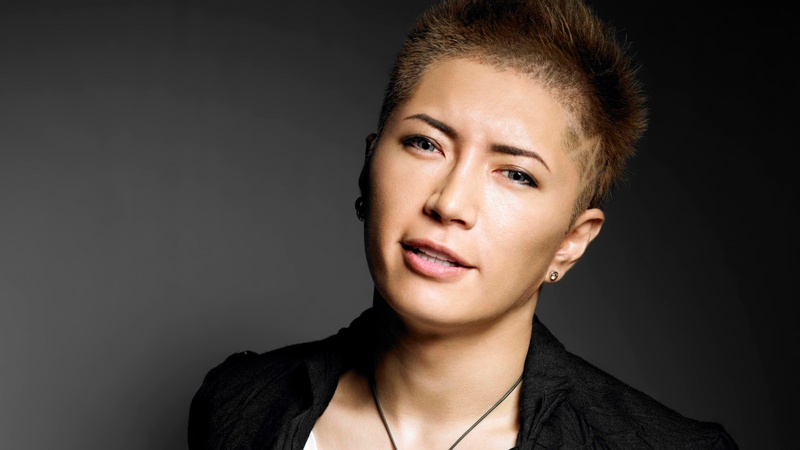 Gackt is hugely popular in Japan — a superstar. “He has released nine studio albums and, with forty-two singles released, holds the male soloist record for most top ten singles in Japan music history. His single ‘Returner (Yami no Shūen),’ released on June 20, 2007, was his first and only single to reach the number one spot on the Oricon charts.” See the MV for “Returner” below. GACKT 「RETURNER ～闇の終焉～[Yami no Shūen]」 uploaded to YouTube by crownrecord on 21 June 2010. Gackt has also been active in TV drama series. He appeared in Akumu-chan, starring Kitagawa Keiko, a Nihon TV series that began in Oct. 2012. In the video below, Gackt and Kitagawa appear in a TV game show to promote the series. (He’s in shades in the first row. Kitagawa, in white, is on his right.) In 2007, he played daimyo Uesugi Kenshin in the NHK Taiga drama Fūrin Kazan. For this role, he won the TV Navi award for best supporting actor in drama. Gackt’s “Returner” was the title song for the TV series. ヒルナンデス PART3/3 GACKT & Keiko Kitagawa & Yuuka ～悪夢ちゃん～ uploaded to YouTube by paako0124 on 27 Oct. 2012. 1 Gackt Live Tour 2003: Jougen no Tsuki – Saishu-Shou; uploaded to YouTube by magnumdesu on 5 April 2009. 2 神威 楽斗 Kamui Gakuto. 3 オレンジの太陽 “The Orange Sun,” a duet written and performed by Gackt and Hyde. 4 Directed by Takahisa Zeze and released on 19 Apr. 2003. 5 magnumdesu in a comment on the video. This entry was posted in Actor/Actress, Concert, Culture, Film, Images, International, Music, Video. Bookmark the permalink.